Bison sometimes move to lower elevations to graze when ice or heavy snow covers the ground in Yellowstone National Park. Photo by Paul Cross. Last winter, government agencies killed one third of Yellowstone National Park's bison herd due to concerns about the possible spread of a livestock disease to cattle that graze in areas around the park. Such drastic measures may be unnecessary, however, according to researchers who have assessed the risk of disease transmission from Yellowstone bison to cattle. "There are more cost-effective management solutions than the current approach, which has been highly controversial," said Marm Kilpatrick, assistant professor of ecology and evolutionary biology at the University of California, Santa Cruz, and lead author of the new study. The alternatives suggested by the study, such as buying grazing rights from cattle ranchers in a few areas around the park or testing all cattle within a special zone around the park, are not new ideas. But Kilpatrick said his group's quantitative risk assessment highlights the substantial benefits of these strategies, as well as their consequences. He worked with Colin Gillin of the Oregon Department of Fish and Wildlife in Corvallis and Peter Daszak of the Consortium for Conservation Medicine in New York on the study, which is scheduled for publication in the February issue of the British Ecological Society's Journal of Applied Ecology and will be published online January 12. The researchers developed a quantitative risk assessment model for the transmission of brucellosis from bison to cattle in the Yellowstone area. Brucellosis is a bacterial disease that causes weight loss, abortion, and reduced milk production in cattle. It is considered a major threat to the cattle industry, which has achieved "brucellosis-free" status in most states after an intensive effort by the U.S. Department of Agriculture. The Yellowstone bison herd probably became infected from cattle that grazed in the park a century ago, Kilpatrick said. Now, cattle ranchers want to keep the bison confined to the park. 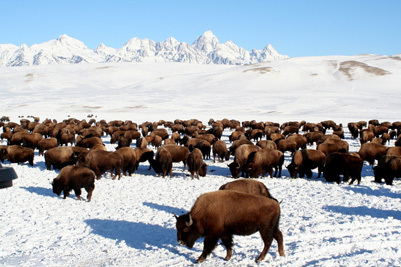 During severe winters, however, when heavy snow or ice covers grasslands within Yellowstone, many bison move outside the park's boundaries to graze at lower elevations. To keep them away from areas where cattle graze, state and federal agencies try to herd the bison back into the park by "hazing" them with helicopters, horses, and snowmobiles. When that fails, the bison may be shot or rounded up, tested, and shipped to slaughterhouses. Kilpatrick and his coauthors sought to quantify the risk of brucellosis transmission to cattle under a range of different scenarios. Their study showed that the risk is very low in most years and is periodically high only in certain localized areas. "There are just a few areas where cattle graze around the park. Compensating ranchers for the grazing rights for those areas would be much more cost-effective than the current management plan," Kilpatrick said. Efforts to acquire key habitat outside the park for the bison are being pursued, but the process has been lengthy and challenging, he said. Another proposal has been to consider the greater Yellowstone area of Montana as a separate zone from the rest of the state in terms of brucellosis infection status and to provide yearly testing of all cattle within that zone. The cost would be just a fraction of the amount spent by government agencies on the current management strategy, which was estimated in 2000 to be about $2.5 million per year, Kilpatrick said. Similarly, compensating ranchers for the value of all the cattle that graze on public and private lands around the park (assuming they would sell their rights), would cost about half the current yearly amount. "To me, the most interesting result of the study was that in a number of years, the model predicts there will be no risk of transmission at all," Kilpatrick said. "Even with the bison population at 7,000--the largest population size in our simulations--there was zero risk 10 to 15 percent of the time, because even when some bison leave the park, they don't always give birth and leave infected birthing materials." To transmit brucellosis to cattle, an infected bison would have to enter an area where cattle graze and abort or give birth, leaving infected tissue on the ground, and cattle would then have to contact the infected material while the bacteria in it were still alive. Kilpatrick noted that so far there have been no documented cases of brucellosis transmission from unconfined bison to cattle, although transmission from elk to cattle has occurred several times around feed grounds. Blood tests show that about half the Yellowstone bison herd has antibodies indicating exposure to the brucellosis bacteria, but it's much harder to determine if an animal is actually infected, he said. Vaccination efforts are currently under way to reduce the prevalence of brucellosis in the bison herd. Eliminating the disease entirely would be very difficult without rounding up all the bison and vaccinating every animal for several years in a row, Kilpatrick said. Even in the absence of brucellosis, however, management challenges would remain, he said. Without periodic culling, the Yellowstone bison population will continue to grow and could reach 7,000 by 2012. As the population grows, more bison will tend to leave the park, and the massive animals are not particularly respectful of fences and property lines. "Bison used to roam the plains in the millions, and they will try to do so again as their population grows," said coauthor Peter Daszak. "Ultimately, our society will have to decide whether to let bison roam freely or continue shooting them. It's a tough challenge, but hopefully our analysis provides a way forward for alternative approaches." There are other bison herds on public and private lands in the United States, but the Yellowstone herd is the only one that has remained free-ranging and unconfined. A record number of Yellowstone bison--about 1,600--were killed last winter. With the herd now reduced to about 3,000 animals, a repeat of that is unlikely this year, Kilpatrick said. But the controversy over how to manage the herd is bound to continue. "I hope this study improves the understanding of the overall situation and enables implementation of new management approaches," Kilpatrick said. Funding for the study was provided by the Wilburforce Foundation, the National Fish and Wildlife Foundation, the National Science Foundation, and the V. Kann Rasmussen Foundation. Note to reporters: You may contact Kilpatrick at (831) 459-5070 or marm@biology.ucsc.edu.